In commemoration of the 75th anniversary of the Regina Riot, the Saskatchewan Archives is pleased to provide you this sample of records pertaining to the events of that time. It features selected images of the Trekkers, the riot and the eyewitness testimony collected from the Regina Riot Inquiry Commission. As a result of the Great Depression (1929-1939) the Government of Canada constructed a large number of 'relief camps' in order to house and utilize more than 170,000 unemployed young men. The camps were often located in remote areas across the country; conditions in the camps were often squalid and the rights of the men were extremely limited. For example, the men were paid very little, had limited access to medical supplies and were not allowed to vote in federal elections. As time wore on many men despaired that their situation would not improve without direct action fom the Government. As a result, on April 4th approximately 1600 men staged a walkout from their camps in British Columbia and two months later their leaders resolved to set them on a course to Ottawa, riding the railway, in order to present their demands to the Government directly. Initially the government did not pay much heed to the trekkers, thinking that the expedition would disperse of its own accord once they reached the mountains. Nonetheless, the trek persevered and emerged from Alberta, making its way to Regina. 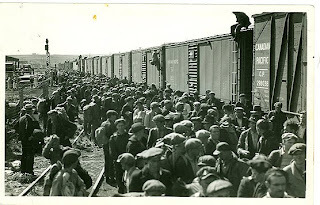 The government then made the decision that the trek would need to be stopped as they feared that once the workers reached Winnipeg they might have the power to destabilize the government. The trekkers stayed in Regina for about three weeks where they received significant support from the local population. On July 1st, Dominion Day, at a rally held in Market Square, the leaders of the trek were preparing to announce that the trek was effectively over and that the men would either be repatriated back to B.C. or to a relief camp of their choice. This announcement never came as the RCMP stormed the Square, clubbing the trekkers and firing tear gas into the crowd. The leaders of the trek were arrested but the ensuing riot claimed the lives of two people and injured 100 more. A commission of inquiry investigating the riot was instituted by the Province of Saskatchewan soon after the riot. The Commission analyzed details of the trek, their grievances, their time in Vancouver, their travel to Regina, their stay in the city and the circumstances leading up to and including the riot. The records presented by this blog are a sample of those generated from the Riot Inquiry Commission. To view Photographs, Telegrams, Testimonies or a list of the Casualties of the Riot please click on the appropriate link in the Pages column on the top right hand corner of the page. The collection (R-255) consists of records created, accumulated and used by the Regina Riot Inquiry Commission that held hearings from November 1935 to March 1936. The Commission examined the issues that contributed to the riot in the Regina Market Square on July 01, 1935, between relief camp workers and the RCMP and the Regina City Police. Types of records included are the final report of the Commission, its proceedings, exhibit and witness indices along with various pieces of evidence exhibits. Examples of the exhibits include bullets, photographs, newspaper clippings, telegrams, correspondence, blueprints, plans and a drawing. The Saskatchewan Archives plays an important role in preserving the cultural resources of the province. It acquires and preserves records essential not just for self-knowledge, but also for the protection of our rights, individually and collectively. To maximize accountability and efficiency, the Saskatchewan Archives also provides information and records management for the Government of Saskatchewan. Through acquisition, preservation and provision of access to official records, the Saskatchewan Archives enables the Government of Saskatchewan to fulfill its public trust.